One of my favorite activities in a winter evening is taking a bath. I just wish I had more time for it! I feel like it’s a pretty rare occasion around here with two little kids. If you are lucky enough to enjoy a bath every once in awhile, do you use bath bombs? 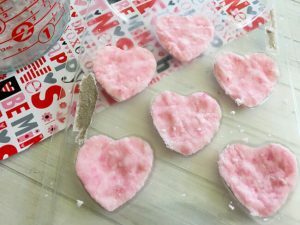 Today I’m sharing how to make your own heart bath bombs! 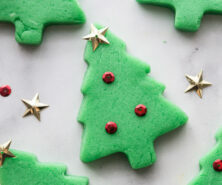 These are actually really easy to make and will save you money over buying the expensive store brand. Note – these bath bombs are a treat for an adult bath! They should be made and used by adults only. 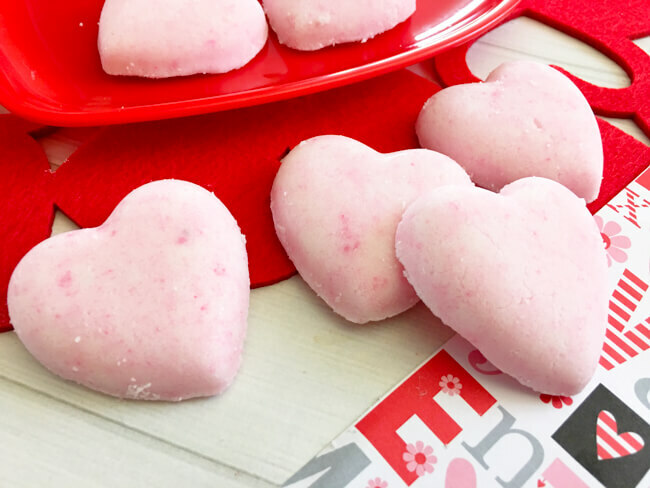 These bath bombs are made to mold into little hearts. 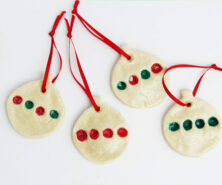 But you could actually make these and mold them into any shape! I even saw on Facebook someone used the inside of a Christmas ornament to form the shape of a sphere bath bomb! Now that is creative! But if you search Michaels or even on Amazon there are all kinds of molding trays you can use. You can find the heart molding tray or even go for a star mold or circle mold. 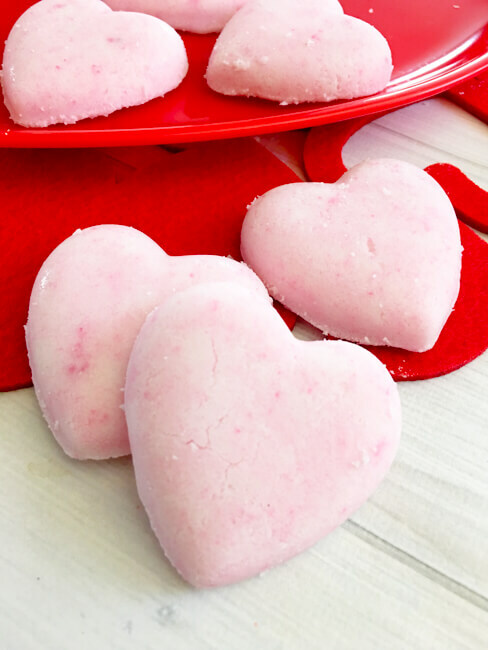 Note: these bath bombs are made with basic ingredients found in most bath bomb recipes. However, if you notice any skin irritation, discontinue use immediately. Adults only should make the bath bombs. 1. 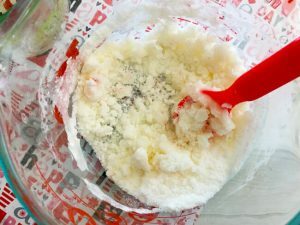 In a large bowl, combine your citric acid, baking soda, and cornstarch then mix well. There you go! Aren’t they so pretty? 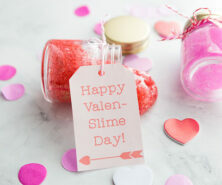 When you plop these little guys into the bath that fizzing action is amazing! It’s my favorite part. 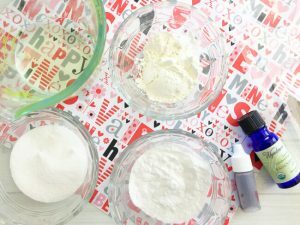 Have you made your own bath bombs before? In a large bowl, combine your citric acid, baking soda, and cornstarch then mix well. 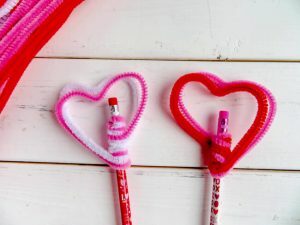 If you are looking for more fun Valentine’s Day crafts you have to make these adorable Heart Pencil toppers . 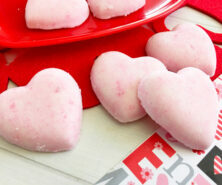 These Button Heart Cards are also really easy to make and look so pretty! 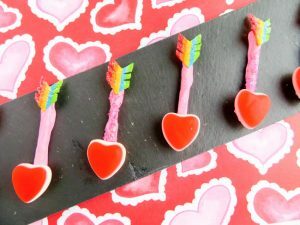 And if you’re looking for a delicious Valentine’s Day treat – make these fun and simple Cupid Arrow Candy Treats!